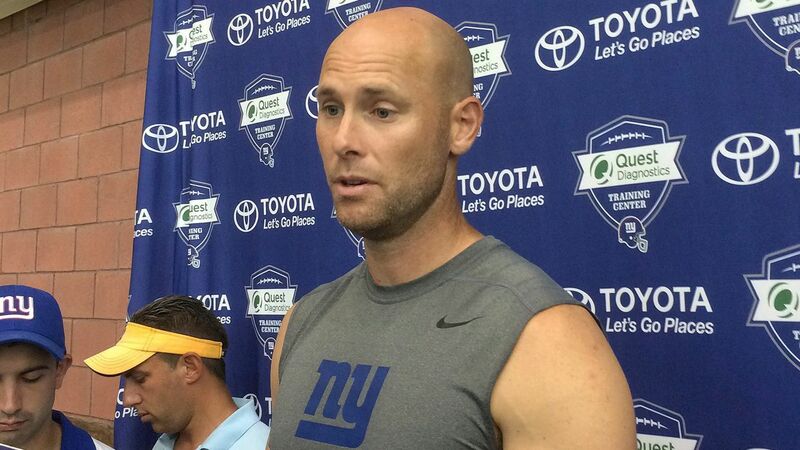 NEW YORK -- The New York Giants released placekicker Josh Brown on Tuesday, six days after police documents revealed Brown admitted to repeatedly abusing his former wife while they were married. The move came shortly after the player issued a statement insisting that he never hit his wife during a six year period when he admits spousal abuse. Giants President John Mara says the team's beliefs, judgments and decisions were "misguided" in how it handled its relationship with Brown. He indicated the Giants did not know the full extent of Brown's problem until last week. "We hope that Josh will continue to dedicate himself to rehabilitation, and to becoming a better person and father," Mara said in a statement. "We will continue to support him in his efforts to continue counseling, and we hope that Josh and his family can find peace and a positive resolution." It is not immediately clear whether Brown will receive the rest of his $1.26 million salary. Brown was previously suspended for the opening game of the season for violating the league's personal conduct policy after the NFL investigated his arrest in May 2015 for spousal abuse against his now ex-wife, Molly. Brown was accused of grabbing his wife's wrist as she tried to reach for a phone, causing a contusion and bruising. He was not charged by local authorities in the case in Washington state. But documents released by the King County Sheriff's Office, including journals and emails, detailed a history of abuse far greater than Brown acknowledged when he spoke about being disciplined before the season started. "I have taken measures to get help so that I may be the voice of change, not a statistic," Brown said Tuesday. "It is important to share that I never struck my wife, and never would. Abuse takes many forms, and is not a gray area. Through the past several years I have worked to identify and rectify my own behaviors." Two days after the admissions became public, Brown was placed on the commissioner's exempt list on Friday while the league considered further discipline. The league said it tried but failed to get more details from authorities after Brown's arrest. Molly Brown declined to speak to league investigators, saying she did not trust that the NFL had her best interests at heart, according to a police report. The Giants discussed Brown's future after returning from London and a 17-10 win over the Rams on Sunday. They announced their decision on Tuesday. Brown was left home for the game. The documents showed Brown's wife told investigators that the abuse and other threatening behavior stretched from 2009, when she was pregnant with their daughter, to the Pro Bowl in January 2016. She alleged that during that time he shoved her into a mirror, breaking it, and that he shoved a chair into her leg, bruising it, according to the report. "The road to rehabilitation is a journey and a constant modification of a way of life," Brown said in the statement. "My journey will continue forever as a person determined to leave a positive legacy and I embrace the opportunities to show and speak about what has helped me to be that man." At the Pro Bowl in Honolulu, Brown's wife said she called NFL security to move her and her three children to another hotel to avoid harassment from her estranged husband. She said he had pounded on their hotel door seeking to get in. Brown's former wife did not respond to messages last week seeking comment from The Associated Press. A law firm representing the kicker declined to comment. The NFL's official policy is to suspend players guilty of domestic abuse for six games on their first offense. Brown apologized to the Giants Tuesday for having his past bring the integrity of the team into question. Brown was not in the locker room Tuesday, the last day the team met before starting a bye-week break.